PASCAGOULA, Miss., Nov. 24, 2010 -- Northrop Grumman Corporation's (NYSE:NOC) Shipbuilding sector successfully launched the company's newest amphibious transport dock ship Arlington (LPD 24) on Tuesday morning, Nov. 23. 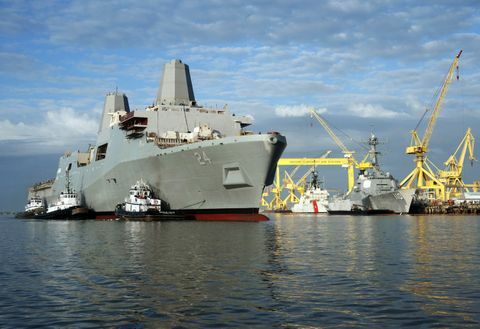 LPD 24 is the third U.S. Navy ship to bear the name Arlington . The 11 ships of the LPD 17 class are a key element of the Navy's ability to project power ashore. Collectively, these ships functionally replace over 41 ships (LPD 4, LSD 36, LKA 113, and LST 1179 classes of amphibious ships) providing the Navy and Marine Corps with modern, sea-based platforms that are networked, survivable and built to operate with 21st Century platforms, such as the MV-22 Osprey and the Expeditionary Fighting Vehicle (EFV).